Human immunodeficiency virus — HIV — is believed to have evolved from a simian immunodeficiency virus, or SIV, that originated in chimpanzees. How SIV made the species jump has remained a mystery, since human bodies possess a defense mechanism that should prevent such infections. Tetherin, a crucial protein for this protection, acts as a sticky pad on the surface of infected cells, preventing them from releasing nascent virus particles. In this evolutionary battle, viruses have developed their own arsenal of proteins as a countermeasure. For example, Vpu, an HIV accessory protein that targets tetherin, allows HIV to escape and spread. An international team led by Kei Sato and Yoshio Koyanagi of Kyoto University set out to test whether the evolution of Vpu could have aided SIV in making the leap to humans. Their study, published in the journal Cell Host and Microbe, helps explain how HIV came into our world. "We used an immunodeficient mouse model with a reconstituted human immune system, established through the transplantation of human blood-forming stem cells," explains Koyanagi. This design, he adds, allowed for both SIV and HIV infection to be studied in the mice. Using reverse genetics to engineer several HIV strains with different Vpu mutants, the team investigated which Vpu function was key for successful virus infection. "Vpu can inhibit immune signaling pathways in the cell and degrade tetherin," states Sato. "The Vpu variant responsible for downregulating tetherin was the most important property of Vpu for HIV." 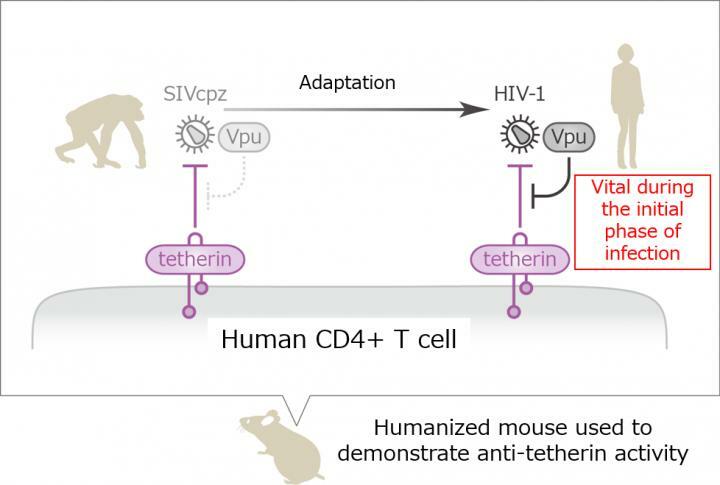 They also found that returning tetherin to normal levels could suppress virus replication, suggesting that a minimal number of tetherin molecules can combat HIV. Interestingly, SIV could not effectively infect human blood cells in the mouse model. But when SIV Vpu was endowed with properties resembling HIV Vpu — namely, anti-tetherin activity blood cell infection did occur. "From an evolutionary standpoint, our study suggests that a gain-of-function ability in Vpu to overcome human tetherin allowed SIV to infect a new host: us," concludes Sato.